There's only one antidote to our speed-crazed, tech-obsessed, gluten-sensitive, password-plagued, financially-jittery, fitness-phobic, fatness-fearing world-and that's laughter.He Who Laughs, Laststakes the hassles and headaches of everyday life and converts them by alchemy into humor. 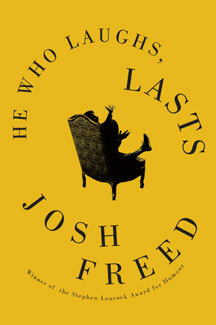 This is the latest hilarious collection from Josh Freed, winner of the Stephen Leacock Medal for Humour-and twice named Canada's best newspaper columnist. Studies show laughter adds several years to your life, Freed recommends that readers take two pages of this book each morning-and live longer. Recommended by pharmacists! Josh Freed's Saturday column in the Montreal Gazette is an institution in Montreal and is often syndicated to other Canadian cities, including The Victoria Times-Colonist, Vancouver Sun, Vancouver Province, Edmonton Journal and Calgary Herald. He is the author of three previous humorous collections: Sign Language and Other Tales of Montreal Wildlife, Fear of Frying and Other Fax of Life, and Press One and Pray and Other Letters from Voice Jail. 156 pp 8.5" x 5.5"